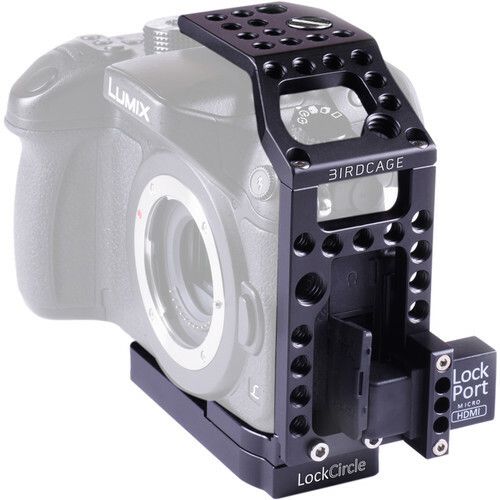 Designed specifically for the Panasonic Lumix GH4 and offering a secure and safe LockPort Micro-HDMI to full-size HDMI adapter, the LockCircle BirdCage GH4 Kit will help expand the abilities of your mirrorless system without weighing it down or limiting features. The asymmetrical design keeps the right-hand grip and controls open for rapid and comfortable use. Also, it features a Twin Baseplate that incorporates an ultra-thin plate and a T-Riser for use with low- or normal-height setups. The aluminum cage sports twenty-eight 1/4"-20 and three 3/8"-16 threads for attaching a variety of accessories with ease. Accessory Mounting Threads 28 x 1/4"
Box Dimensions (LxWxH) 8.1 x 4.6 x 4.2"